Use Conformable Traction Tape to add slip resistance to uneven or textured surfaces that other tapes would struggle to stick to. This coarse tape comes in 3 sizes and 3 color options (black, yellow, black/yellow). If you want to call attention to an area in addition to adding traction, select a bright yellow or black/yellow hazard pattern. Conformable Traction Tape is suitable for use indoors or outdoors and is resistant to water, so it can hold up to the elements. No need to worry about replacing it frequently. 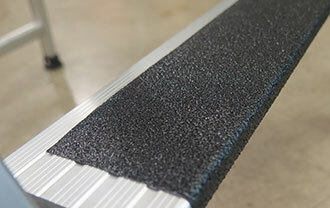 Conformable Traction Tape sticks to uneven and textured surfaces. Worked on our bumpy floors! Our floors are uneven and it has been difficult to find tape or any floor marking for that matter, that would work well for us. This tape has done the job and has held up well over the last year.